If you are going to have weight loss surgery, there's a very good chance your doctor will place you on a high protein diet after gastric bypass bariatric surgery. Protein plays an important role in maintaining your body's lean body mass as you lose weight. A high protein diet after gastric bypass bariatric surgery helps you recover from your surgery and lose weight in a healthy and safe fashion. The high protein diet after gastric bypass bariatric surgery begins almost as soon as you arrive home from the hospital. During the first few days of recovery, your doctor will likely have you on a clear liquid diet in order to facilitate healing; however, within a few days you will progress to a modified liquid diet that lasts for about two to three weeks. During this phase of your diet, you will begin to focus on nutrition with a high protein level. During this modified liquid diet, the doctor will have you drink small amounts of high protein liquids several times a day. 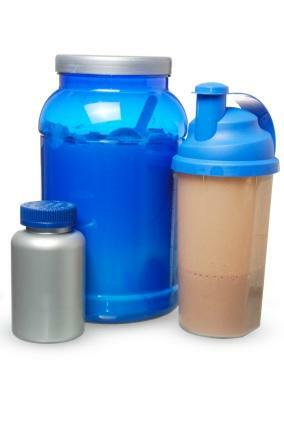 In this phase, high protein liquids will include foods like protein shakes and meal replacement liquids such as Boost or Ensure. In the third phase of your diet, which usually begins about three to four weeks following gastric bypass surgery, you will begin eating soft foods relatively high in protein. High protein soft foods include scrambled or soft boiled eggs, beans and legumes, soft fish like halibut or tuna, and meats that have been cooked to a soft texture. Your doctor may also recommend you eat other nutritious soft foods like well-cooked vegetables or oatmeal. In the final phase of your post-surgical diet, which will last the rest of your life, you will return to eating foods you ate prior to your surgery, only in smaller amounts. It is recommended that a significant portion of your caloric intake comes from controlled portions of lean protein foods. This is your diet for life, and your doctor can help you determine the right portion of macronutrients - including fat, protein and carbohydrates - for you to eat on a daily basis. Because you are now eating smaller amounts of foods, nutrition is key, and your doctor may also suggest supplementation. There are a few reasons why it is important to eat a high protein, low fat diet following gastric bypass surgery. It is very likely you will lose weigh rapidly following gastric bypass surgery. Eating a high protein, low fat diet helps assure your body isn't losing lean body mass during this rapid weight loss. This type of a diet is also known as a protein-sparing diet because it helps your body lose fat, and not muscle. Why is this important? It is important because lean body mass is what drives your body's metabolism. Lean body mass includes everything that isn't fat in your body, including muscles, organs and blood. One of the chief reason very low calorie diets often fail is because they don't have a protein sparing effect, and lean body tissue is lost along with fat. This leads to a slow down of metabolism, which means your body requires less and less food the more lean body tissue you lose. A high protein diet can help prevent this from happening. Most candidates for gastric bypass surgery are morbidly obese. One of the largest risks run with morbid obesity is the risk of syndrome X, also known as metabolic syndrome. This is a syndrome characterized by the body's inability to produce the insulin necessary to handle sugar in the blood, which leads to type 2 diabetes and an increased risk of a number of diseases including coronary artery disease and stroke.A high protein, low sugar diet in combination with weight loss following gastric bypass surgery can help control blood sugar, which helps to alleviate the symptoms and risks of syndrome X. If you are having gastric bypass surgery, your physician will work with you on your diet following your surgery. If you follow your surgeon's recommendations for a high protein, low sugar, low fat diet, chances are you will be healthy for years to come.